The Merc with a Mouth joins the non-team without a known lineup! But can a talkative guy like Wade Wilson keep things hush-hush? Following Deadpool through the ever-rotating door of the Secret Defenders are the Heroes for Hire and a future Guardian of the Galaxy! Luke Cage is among the first recruits for new leader Doctor Druid, taking on the malevolent Malachi! But will he and Deadpool dig Cadaver, their newest ally? Then, Iron Fist, Giant-Man, Iceman and Archangel will feel the sting of Swarm! Spider-Woman, Venom and U.S.Agent enlist for a showdown with Slaymaker, while the mysterious Shadowoman transforms into Sepulchre! 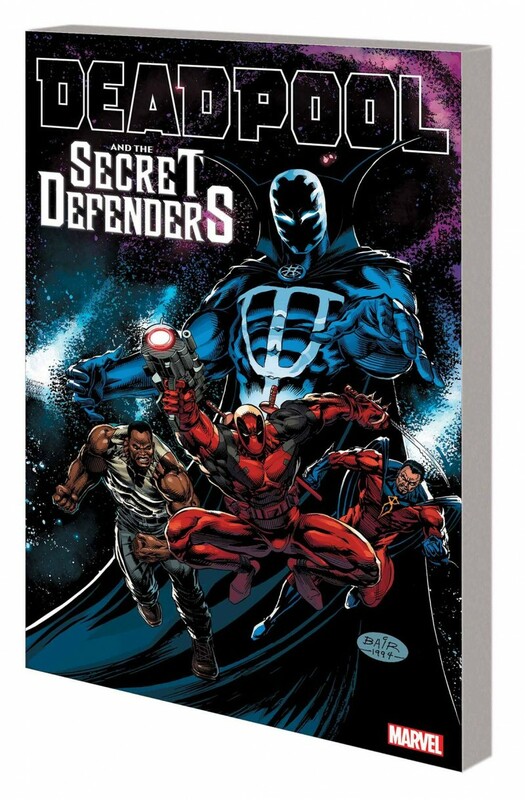 Then, Dagger, Deathlok and Drax the Destroyer join the fun when the Secret Defenders battle…the Defenders?! Is this the end for comics’ most surreptitious super group?